With our Davao and Surigao trip wrapped up, we are now getting set for a yet exciting summer trip to Bohol and have fun under the Sun with Nivea. 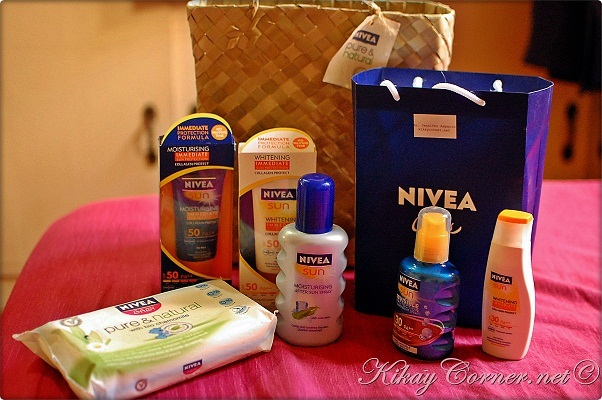 I received a handful of Nivea products just before we left for Davao but won’t get to try it until we bask under the Bohol sun. Director of NIVEA SUN UV Protection Research, Dr. Stephan Ruppert said, “Only very few people apply the amount recommended by the EU – around 36 grams or 6 teaspoons for an adult.” Because of this Nivea came up with an easy rule of thumb for applying the right amount of sunscreen. “You can’t go wrong if you use the length of your own hand to gauge the right amount,” explains Dr Beate Uhlmann, who developed this rule in the NIVEA SUN research centre. A thick line of sunscreen stretching over your palm from your wrist to the tip of your middle finger is a sufficient quantity for one of your arms, or for your face & neck (considered as one body zone). Apply twice this amount to each leg (don’t forget your feet), to your chest and stomach area, and to your back. This allows you to reap the full benefits of the sun protection factor, and you can feel safe and protected in the sun. A hand’s length of sunscreen is equivalent to about 15 sprays of NIVEA SUN spray. The length of an adult’s hand is also the basis for gauging the appropriate amount of sunscreen for children. This amount is adjusted according to their age and height and then applied to the individual body zones as described above. A thick line of sunscreen measuring around 1 to 1 ½ times the length of an adult middle finger, or 5 to 6 sprays of NIVEA SUN spray. A thick line of sunscreen measuring around 1 ½ to 2 times the length of an adult middle finger, or 7 to 10 sprays of NIVEA SUN spray. For children up to 5 years of age, twice the normal amount should be applied to the face and neck, since small children have proportionally bigger heads. Additionally, wearing protective clothing (cap, T-shirt and shorts) protect your children from the sun. Children under 2 should not be exposed to direct sunlight at all, as their skin does not yet have sufficient pigmentation. And don’t forget: if you or your children have been in the water, have dried yourselves off, or are spending an extended period in the sun, make sure you reapply sunscreen regularly.